Motherhood is not easy. It involves constant learning and change as we daily experience so many challenges and emotions. One of the best things we can do is to make sure that we have people we can share the experience with. Family can be great at this time. Many mums feel a bond with their own mothers once they have had children. The shared experience brings a deeper connection and understanding. We are social creatures and no matter how much going it alone is valued in our society, motherhood is not meant to be done in isolation. It is meant to be done in communities. That idea of communities is dramatically changing but no matter what form your community takes, we get great benefit from that support. Some mothers find themselves in a situation where they have easy access to other mums, whilst others have to actively seek these connections out. Of course, how we make friends is very individual and will depend on each person. The traditional way is through Mother and Baby groups but there are also Health visitor lead meetings that have a social aspect, interactive baby groups like baby yoga and now connections through social media. It can be tough turning up alone at a new group on very little sleep, particularly when friendships don’t happen instantly. However, it is worth doing to help ourselves in the long run. One point to make is that not all groups are supportive. Social interaction is important but not worth it if it is detrimental our own wellbeing. All of the women I interviewed found mum friends invaluable but some experienced groups that were either less than friendly or very competitive. They made a sharp exit and found somewhere else more accepting. When I had my first son, I found myself at home with baby alone for long hours because my husband, family and friends all worked full time. For the majority of the day it was just me and my son and I became lonely pretty quickly. I looked up local mother and baby groups only to find that they were closing for the summer holidays. In desperation I found a baby yoga class, that carried on despite the schools being out, in the next town to me. It seemed a long way to travel particularly on such a small amount of sleep and I was nervous about joining this new world of mother and baby groups. But I needn’t have worried, it was the best thing I could have done. Once a week I got out and met up with other mums. It wasn’t an immediate success. It took time to make friends. At first I was unsure of myself as a mum in public, feeling somewhat inadequate, but through talking I realised that we were all in the same boat (with slightly varying challenges). After that I was off. I had broken myself in to socialising with a baby and when the local groups opened I was there, a much more confident and comfortable mum. I would love to hear how you went about making Mum friends and whether you found certain groups easier to get on with than others? Have you remained friends or were they of the time? What do your mum friends help you with? I am glad to hear that you have remained friends with your mum friends. It can be amazing to take this journey with other women alongside us. I’ve written a post this week about the 5 reasons you should join a baby group. I completely agree. Mum friends are invaluable & it’s so important that you & your little one are around like-minded people. Raising a little one is tough, it makes it so much easier & more fun when you have people around who are in the same boat. Thank you Chloe. I will pop to your site and have a read. It is so important and can change our experience of motherhood. They really are. Thanks for visiting. I found it really hard to make mum friends, I was ok to speak to some people at groups, but I am shy and the thought of asking if someone wanted to meet out of groups scared me, when I had my first born I went to groups all the time, so I saw people alot but didn’t really make close friendships, when I had my second one of the friends I had made invited me and someone else over for a playdate, I went along and we are now closer friends, and me and the other mum on that day are really close friends. We all have our own ways of making friends. I am am introvert and like you find that I feel most comfortable with a small number of close friends. I remember how tough it was to go out initially and then asking other mums to meet up was nerve wracking but I got so much from it. Thank you Caroline for commenting. I’m in danger of sounding a bit sad but here I go…I don’t really have any mum friends. When my eldest daughter was born I found the pregnancy very hard (my first child was stillborn at 41 weeks), I avoided any pregnancy groups or classes. After my daughter was born I was so utterly amazed and grateful that she was here that I didn’t seek out any baby groups etc, I was just happy being with her. It was only after a year or so that I began to notice other mums in groups at the park or in cafes and felt I had perhaps missed out – by then I was back to work. When my youngest daughter was born I did do things a little differently, we go to the toddler group in our village and to a class in town. I have mummy acquaintances, we’ll chat whilst at the groups but they are not close friends. I now work from home and find most mums are either working part time or full time too so there is little time to make new friends – I’m trying to concentrate on maintaining my older friendships (none of whom have children, yet!). I can see why mummy friends are important and it would have been nice to find a few! Thanks for this. They are so special and it is wonderful to be in the same place as other people, even more so when there is wine!! That sounds great Elaine. Meeting chatting and watching our kids develop relationships, all with cake too, couldn’t be better. Thanks for your input on this. I am realising that a lot of us find it quite daunting to start with. Thanks for visiting. This is a great post. I agree, making connections with other mums is so important for your well being. I had to make the first move to meet fellow mums because none of my friends had babies. It is difficult but worth it in the end. I found it tough being so tired with a new baby but like you said it is then so worth it. Thanks for your lovely comment. Hi Victoria. Something similar happened to me but I still find and do find now that is so helpful to have other mothers to share with. Thanks for your comment and hosting. I agree whole heartedly Talya. We want friends that we have a connection with anyway not just kids. When it works out it does feel so great. Hi Madeline, Thank you for that. I am realising from all the feedback that actually many women feel quite nervous when they start out at toddler groups. I am glad it worked out for you. It took me a while to make mum friends locally to me and it was such a relief when I did. Great comment. Thanks for visiting. Good luck with your move. We moved when my son was 18 months and I had to start from scratch but I did get to know other mums with kids a similar age. The majority of mums want mum friends so I think they are pretty receptive to newcomers. I agree about the internet. It is another way to connect that can be of great value too. Thanks for visiting. mum friends are so needed when you have a little one. when I had my first child I was the first one to have a baby so I did spend a lot of time on my own, I decided to go to a playgroup but unfortunately it was fairly clicky so I didn’t really make friends. Hi Rebecca, This is something that I have heard and experienced, clicky groups. It seemed strange to me that some were so friendly and others not so. I don’t know what makes the difference. I ran a mother and toddler/baby group and I always made sure that new mums were introduced and felt welcome. I felt it was my duty and pleasure having once been that lonely mum. I am so glad to hear you have made a good friend as has your eldest. It is so great to have another mum to share the journey with. Thanks for your comment. Hi Linda, I do agree. For there to be any significant relationship forming there does need to be something more connecting us. It is tough when we don’t find connections. You make a good point about age. I have heard it the other way round too, off a young mum struggling to connect to the mothers around who were in their late twenties early thirties. Good luck with finding mum friends. Love From Clueless Mum recently posted…Does Parenting Actually Get Easier? I found myself in a similar situation when I tried to get into my local groups. At first I met mums who I could chat to but none that I clicked with but with time. I found some closer friends. Then we moved and it had to start all over again. I personally never needed lots of mum friends but a few were very helpful on many levels. I think persevering and trying different things can be helpful. But also knowing that we are not defined by the number of friends we have either. Thanks for your comment. Most of my friends are a mom themselves. And they get it. All of it. And that is soooo good to know. You can laugh together, suppport each other. Listnen to each others endless kids stories and then just switch to other subjects just as easy. It’s very important to have people who get what you’re saying / experiencing. It’s very healing to feel supported and understood. Yes, yes, yes (I am saying this quite loud in my head) you have the nail on the head there. “It’s very healing to feel supported and understood.” That is it in a nutshell and why motherhood needs to be shared. glad you have that support. Great comment.Thanks for adding to the discussion Miep. Great blog. I totally agree. I have a one year old and I am still struggling to make friends that are local with kids. I have a ton of friends that have kids, but none of them are local. I think the hardest part for me is for moms working full time. We go to work, we pick up our kids, go home, feed them dinner, put them to bed, and then fall asleep exhausted from our day. I struggle to find time to even find other mom friends much less hang out with them. Hopefully in the future that will change. Hi Danielle, You make a very good point as this is so true. Working and mum friends are tough to put together. It can seem like a SAHM issue because of loneliness but we all benefit from mum friends and I can see how they will be hard to make and maintain. New friendships take time to cement together and that really can be an issue in this situation. I hope you find a way to make some mum friends around your work schedule. Thank you for adding to this discussion. Having mum friends was my saving grace with the children were small. They are a life-line and kept my sane! Hi Suzanne, That is something I have heard so much. The shared experience is so important to getting through the tough parts of motherhood. Thanks for your comment. Hi Angela, There is something good about sharing the experience of motherhood with others. It sounds like you had a tough time in the early days. Even just the ability to laugh with someone else can change a lot. Thanks for your comment. My closest new friends when I had my first baby were the small group from NCT classes – I was, and still am, much happier with small groups of good friends, so I found I made closer friendships with them than with people I met at larger gatherings, such as playgroups. We supported each other a lot during those first few months and are still in touch now, 14 years later, despite living all over the country. That is such a lovely thing to hear Daisy. It is wonderful to have that closeness and geographical distance doesn’t change the fact we have that support and someone to share our feelings with. Thanks for your comment. How we best make friends is very individual. Wonderful post! I think your point that not all mom groups are alike is an important one. Mommy society is a lot like school, with cliques and other nonsense alongside genuinely supportive people. Absolutley. We need to pick and choose what works for us and truly supports us. Lovely post. I agree that mummy friends can make or break those early years of motherhood (and beyond). We’ve just moved countries, so I’m having to start all over with friends. It’s so hard venturing out to toddler groups and being the new person all over again. I know it’s worth it in the end, but I hate the beginnings of this process and cannot wait until I have some local mummy friends again. I can so relate. Although we didn’t move countries we did move and it was back to all the time alone, seeking new places out and then being the new girl. A bit like school really. I am sure in no time you will have those mum friends again. thanks for your comment. I have only recently discovered the blogging world and twitter and I feel that it would have added another dimension to my support network when I my boys were young. There is a lot to be said for friends to actually meet with. I am glad to hear you have made friends now. School/pre-school committee are a great way to meet other mums and get friendly very quickly because you are all doing a project together. Thanks for your comment. Loneliness is so tough and when we are doing something so new it can be hard to understand that the challenges are normal rather than about our inexperience. It sounds great that you have got out and found some friends now. As those relationships become longer term they can be a real support. Thanks for your comment. It was essential for me to make friends. I made a whole group of friends from my NCT class and we still meet up even now, 7 years later. I don’t think I would have come through the baby years with sanity intact if it hadn’t been for my friends. I would definitely recommend it to others. Your experience is the general consensus. Maybe I should have called the post ‘Sanity and Mum friends’. Thanks for commenting. Baby groups were a lifesaver for me in those early days – it was amazing how much better I felt about my sleep-deprived state after having a moan about it with another mum who was going through the same thing. I definitely found that some groups were easier than others with regards to making friends though. Thanks for that Louise. This is exactly how I found it too. It became a structure to my week and an emotional release. Yes, I love my mum friends. Thank heavens for people who don’t get boring listening to talk about babies. I was introduced to one through a mutual friend and it took off from there. I’m relieved because I’d never be brave enough to start something myself. It is so true. Mum friends are genuinely interested in all the details and it is such a relief to have someone to share all of that stuff with. Thanks for commenting. I found mum friends by going to baby groups and they are now very firm friends. I was very lonely until I started going! It is great to move from that place to having support and people to share the experience with. Thanks for telling me about your experience. Megan – Truly Madly Kids recently posted…TMK Go – Barcelona. The diary of a family adventure. It is such a universal need to have mum friends particularly in that early part of motherhood. Thanks for commenting. 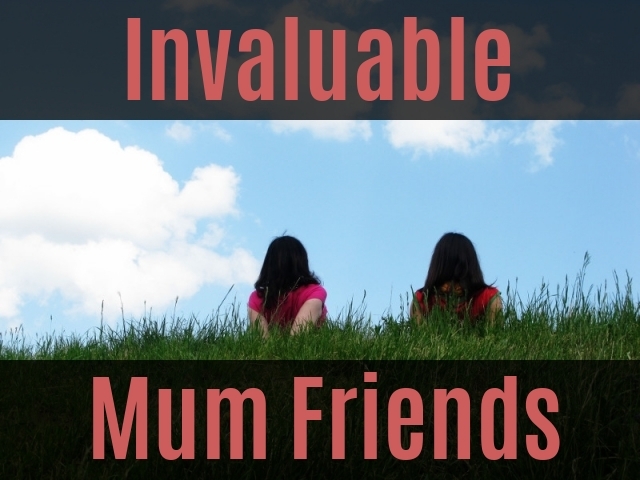 Great post Kirsten, you’re so right about how important mum friends are, particularly in those crazy early days! I made my friends pre-baby at an anti natal class and 3 of us try to meet up every month socially and whenever we can during the day, which is a bit more tricky now we all work but they are the best and I’m so happy to have met them. I didn’t make many new friends post-baby though, I found the groups were impenetrable once you had your baby!! Oh and you are SO right about my relationship with my mum, it was great before but just the realisation post-baby is incredible!! And my mum was so young too. Hannah Mums’ Days recently posted…Introducing Mums’ Days Fit Club and Protest! Thank you for this heart felt comment Hannah. It is my one regret that I couldn’t do a pre baby class to make friends through. It was tough initially making new friends through the mother and baby groups but I got there. Glad to hear the part about your relationship with your mum rang true. It’s hard making mommy friends sometimes, but so worth it. No one else gets it the way they do! It’s definitely worth the effort! I found my mom friends at a Musical Munchkins class, and then through my daughter’s preschool. They’re the best! Thanks for linking up at Manic Mondays! I agree. It is worth the effort and the nerves of putting ourselves out there. I am glad you have a great bunch of friends. I am sure they are happy to have your support too. Thanks for commenting and hosting. Wow Trista. Thank you for including my blog. It is much appreciated. It is tough to move and then join mum groups later on. I didn’t move far but it was enough for me to realise that it can be tough. I personally found joining committees through school useful. There is nothing like working towards a joint goal of a summer fete to get to know people. Good luck with your search. Great post to read. It’s different. I lost many friends when I fell pregnant with my first daughter. I was 16 years old. I was so scared and petrified of being on my own with a baby. I lived with my Dad at the time and he worked full time. When my second child was born I was living with my partner (still am) and he worked full time and I was half n hour away from my family. Luckily I had my partners parents who lived up the road so I went to visit her most days of the week. The past year and a half I have made a very good friend. One of the best friends in fact, someone I know I can just knock the door and get invited straight in. Someone I can rely on and she lives so close by too which is a great plus. Thanks for linking up to #justanotherlinky Hope too see you again Sunday! Hi Beth. That sounds tough to have been on your own with friends having gone off. I am very glad to hear that you have a friend now and it sounds like they are a true friend who will be there for you. It is great to have someone to share the experience of motherhood with. It helps in so many ways. Thanks for sharing. Thanks for hosting your linky Jenny. It is one of the best and you have managed to create a really good community. Your experience of friends improving motherhood for you is so much like my own and many other women out there. We get so much from them at this time. Thanks for commenting and hosting your linky. It is great that you found that lifeline you needed through others mums. It is such a profound and at times challenging experience that it is so valuable to share it with others in the same boat. Good luck with making more friends. It does change. We moved too and I have made new friends but it took me a while longer because there were already established friendship groups.